Ms. Rinalia Abdul Rahim is Managing Director of Compass Rose Sdn Bhd, a private consulting company that provides strategic advice for enhancing organizational and network performance, learning and impact. She has 18-years of experience in ICT policy and international development where she worked on expanding digital inclusion and issues related to access, empowerment and governance. Ms. Abdul Rahim worked with MIMOS Berhad (a Malaysian Government entity) as a Policy Technologist from 1997-2000. Her public policy responsibilities involved developing ICT strategies, policies and programs for national development as well as institutionalizing the multistakeholder consultation approach to policy-making. She also engaged the international development community to explore global mechanisms for nurturing pioneering “ICT for development” (ICT4D) initiatives and for building capacity in the developing world. Ms. Abdul Rahim led the Global Knowledge Partnership (GKP) as its Executive Director from 2001-2008. She was effective in bringing together stakeholders from the public, private and civil society sectors to address development challenges through collaboration. She successfully positioned the GKP as the leading global multistakeholder network in the field of ICT for Development. Under her leadership, the GKP Secretariat moved from the World Bank Institute and was established as a non-profit company in Malaysia. She globalized the GKP membership, established networks in every region, and developed global and regional programs for sharing knowledge, building partnerships, and spreading best practices. At the World Summit on the Information Society in 2003, the GKP co-organized the ICT4D Platform – an initiative that involved 265 partner organizations from 80 countries – to showcase innovative, people-centred, collaboration-based solutions from around the world for reducing poverty, improving lives and empowering people. Ms. Abdul Rahim has held various positions with national, regional and international bodies. Nationally, she served as Member of the Wawasan Open University Council/Board of Governors; Member of the National Information Technology Council by appointment of the Prime Minister; and Executive Council Member of the Internet Society Malaysia Chapter. Regionally, she served as Advisor to the Youth Social Enterprise Initiative and Member of the International Advisory Panel for the UNDP Asia Pacific Development Information Programme. Globally, she served as Vice-Chair of the Global Action Network Council; Member of the Technical Advisory Group for the World Economic Forum-UNESCO Partnership for Education initiative; Strategy Council Member & High Level Advisor for the United Nations Global Alliance for ICT and Development; and Advisor to the International Task Force on Women and ICT. 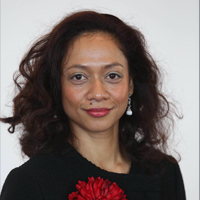 Ms. Abdul Rahim holds a Master in Public Policy Degree from Harvard University and a Bachelor’s Degree in Political Science from Princeton University. She is certified in corporate governance by INSEAD. In 2011, Ms. Abdul Rahim was appointed to the ICANN At-Large Advisory Committee(ALAC) where she focused on issues of concern and interest to Internet end users. She served in the ALAC Executive Committee/Leadership Team throughout her 2-year term. In April 2014, she was elected by the At-Large community of individual Internet users worldwide to serve as an ICANN Board Director for a three-year term (October 2014 – October 2017).